Any time a beloved franchise gets remade these days, controversy will surely follow. After years of trying to get a Ghostbusters sequel off the ground, Sony Pictures finally gave the green light last year to a reboot, with a cast of all-female Ghostbusters including Kristen Wiig, Melissa McCarthy, Leslie Jones and Kate McKinnon. Production wrapped last month, and while fans wait for the first trailer, original Ghostbusters director Ivan Reitman and star Dan Aykroyd, who has a cameo appearance in the reboot, offered new details in an interview with Entertainment Weekly. Dan Aykroyd gave strong praise to director Paul Feig, and even made a bold statement that might create even more controversy: this reboot may be better than the original. "Paul's kind of the George Cukor of Hollywood: He has a great touch directing female actors and he really knows how to hit the female psyche and sensibility. In a way, his movie might be a little better than the first two because they can do more - CGI might be a little better. But also, you know, there might be more jokes in it. I'm really happy with what I'm seeing." Ever since this version of Ghostbusters was announced, there has been no shortage of fans expressing their distaste for the all-female Ghostbusters, which built to a point where director Paul Feig fired back at all of the haters on his Twitter page. Despite all of the backlash from fans, Ivan Reitman, who produces the reboot with Dan Aykroyd, said he thinks this is the perfect time for a reboot, while praising the director's gender-swapping pitch. Here's what the producer had to say about this fresh take. "It was time. For much the same reason that the original Ghostbusters couldn't really be the stars of this movie, including Harold (Ramis) who passed away, it was time to get fresh blood in there. I think Paul's idea of the gender shift was a very smart and fresh way to get everybody to re-look at this in a new way." It was revealed fairly early on that this Ghostbusters reboot would have no connection to the original movie and its sequel, but most of the original stars signed on for cameos, although they would be playing completely different characters. Fans were given a big surprise when it was finally confirmed that Bill Murray agreed to come aboard, after years of refusing to come back for the sequel. Dan Aykroyd revealed that he never "begrudged" Bill Murray for dismissing the original plans for a sequel for years, while offering details about the sequel script he wrote called Hellbent. "I never begrudged him not being in the third movie, though I wrote a nice part for him in Hellbent, where the Ghostbusters go to hell. He's got very high standards and a high bulls- detector." Long before the all-female reboot came about, there were several different versions of the script, with Dan Aykroyd taking over the writing duties at one point. Bill Murray would often hint at possibilities of coming aboard, when the movie was planned as a sequel with the original stars, and there were rumors that he may be signing on for a cameo in the reboot, which was finally confirmed in August. Ivan Reitman revealed that he ultimately told Bill Murray he would feel 'silly' if he didn't have a cameo in the new Ghostbusters, and he came on board. "First of all, it's a great scene. I finally called him up and I said, 'Bill, you have to do this. This movie's great, and you're going to feel silly not being part of it.' And he agreed." Unfortunately, no details about his appearance were given, but it has been rumored that Dan Aykroyd cameos as a cab driver, in a scene with Kristen Wiig. Other original stars such as Sigourney Weaver, Ernie Hudson and Annie Potts also came back, portraying different characters in the movie. Dan Aykroyd added that none of the original stars "lobbied" for cameos, but he agreed to cameo when asked, stating he wanted to help in any way he can. After years of trying to persuade Bill Murray to return, Dan Aykroyd had this to say about the actor finally coming on board, hinting they may want him back as Peter Venkman for a straight-up Ghostbusters sequel. "I was surprised and delighted, because it was hard to read whether he was going to approve of the thing or not. It's nice to have him back onboard. Now that he's done this one, maybe he would come back and play Venkman for [another Ghostbusters] at some point. [The ladies] were swooning after he left. And he said, '[The new Ghostbusters are] all so great.'" Ivan Reitman added that he hopes to see a cut of the movie within the next two weeks, while Dan Aykroyd hinted that he wants to bring his Hellbent script to life, with another younger cast. 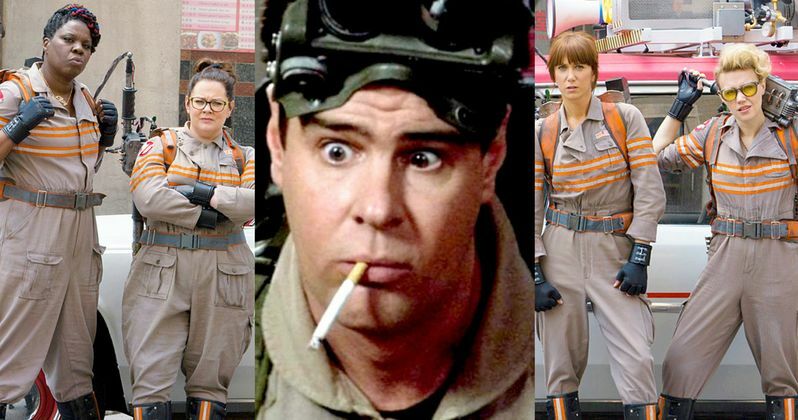 What do you think about all of these new Ghostbusters details? Do you think it has the potential to be better than the original? Stay tuned for more details on the reboot, slated to hit theaters July 15, 2016.